UNIVERSITY PARK (AP) – The equipment is put away for the winter. The stadium will be empty for months. The Nittany Lions aren’t going anywhere. And Joe Paterno’s statue is still nowhere in sight. But if you want to see for yourself what the NCAA’s version of purgatory looks like, then by all means, come visit Happy Valley in the middle of another bowl season from which Penn State’s football team has been banned. If nothing else, the locals will appreciate the business. Some two years after Jerry Sandusky’s name and stomach-turning deeds exploded in the headlines like a thunderclap, the reverberations ripple across this campus and community still – and will for years to come. Several victims of Sandusky’s serial sexual abuse continue to live nearby and the trials of three former Penn State administrators, as well as a handful of lawsuits over who shares the blame and how much, are wending their way through the courts. Meanwhile, Sandusky, who turns 70 next month, sits in a maximum-security prison three hours’ drive west of here, serving a 30-to-60-year sentence. Most townspeople, many alumni, faculty and students, and especially Paterno’s family still chafe over the injustice of a university’s reputation dragged through the mud, and a coach’s legacy of wins and good deeds crumpled up and discarded like just so much litter. Over the course of his 61 years at Penn State, Paterno became not just the face, but the cantankerous soul and benefactor of a school that was transformed from a “cow college” into a top-shelf public university. But to find any trace of him today, you either have to visit the library he and wife Sue raised funds to help build – where the family name remains etched in stone – or drive a few miles out of town, where a giant billboard juts out from the rolling landscape stubbornly proclaiming “Joe Paterno, 409 wins” in Penn State’s famously spare blue and white color scheme. Others, of course, think that punishment and all the others piled upon the school and a football program that outsiders judged to be running amok weren’t nearly harsh enough. “This summer I spoke to a group near Wilkes-Barre and afterward, the debate heated up over our family’s lawsuit,” said Jay Paterno, sitting in a booth at The Corner Room, a restaurant that looks much as it did when his late father began eating breakfast there as an assistant coach in the 1950s. Few people on either side expect the debate to quiet down in any meaningful way until the trials of former Penn State president Graham Spanier, athletic director Tim Curley and vice president for finance Gary Schultz – all accused of trying to cover up the scandal at the time – are completed. But nearly everyone agrees that one group at Penn State has already moved on. Against the odds, and despite being hamstrung by some of the most onerous sanctions the NCAA ever handed down, the Nittany Lions football team has won back a measure of respect and more than its fair share of games, posting 8-4 and 7-5 seasons under coach Bill O’Brien. If anything, the job should get easier from here on out, especially after NCAA president Mark Emmert said in September some scholarships would be restored as early as next season, and that the four-year bowl ban could be modified as well. The biggest danger to the program at the moment, in fact, are persistent reports that O’Brien is listening to overtures to return to the NFL, this time as a head coach. Should it happen, athletic director Dave Joyner’s first rebuilding experience will come in handy. “When I came over here from the board (of trustees), my goal was not to drive the ship forward,” he said. “It was to keep it from sinking. Joyner’s task was made easier by the addition of an independent, full-time athletic integrity officer, a first in college sports, and a beefed-up compliance staff that is now second to none. For all that, he never doubted which of his hires would draw the most scrutiny. O’Brien arrived with sterling credentials; apprenticeships coaching at Brown, Georgia Tech, Maryland and Duke, followed by five years as an NFL assistant on Bill Belichick’s staff in New England, where he rose through the ranks to become offensive coordinator. He needed to be, of course. Because of the sanctions, the program he inherited was undercut by the defections of the team’s best running back, top receiver and its front-line kicker – more than a dozen players in all. But O’Brien might be the last guy you’ll catch feeling sorry for himself. His young son, Jack, suffers seizures upon awakening every morning and has limited motor skills due to a rare genetic brain malformation called lissencephaly. Indeed, the O’Briens are battlers, and the coach brought that same attitude from home to work every day, patiently turning the Nittany Lions’ weaknesses into strengths. 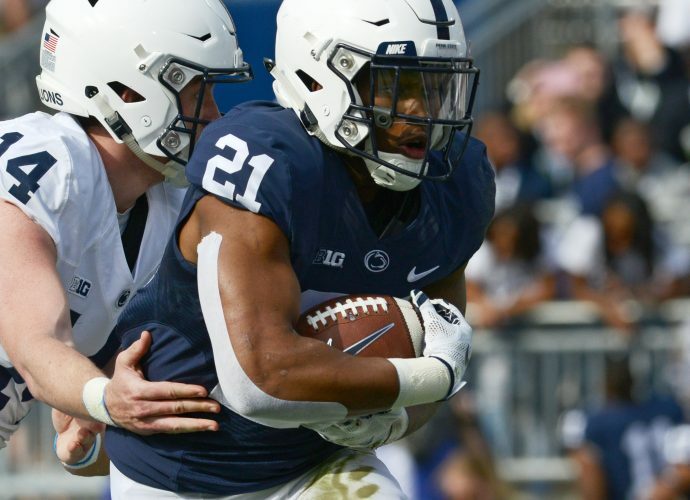 When Silas Redd took most of Penn State’s running game with him by transferring to Southern California, O’Brien drew on his experience at New England and turned former walk-on quarterback Matt McGloin into an NFL-ready one. After kicker Sam Ficken missed four field goals, including a potential game-winner, O’Brien refused to blame the inexperienced backup and instead had the Nittany Lions try to convert fourth downs in a variety of unlikely situations. His players loved that, and returned every show of loyalty in kind. A day earlier, Urschel was in New York to receive the Campbell Trophy, awarded annually to the nation’s top student-athlete. When Joe Paterno used his next-to-last recruiting slot on Urschel five years ago, it was a typical Penn State pick; back then, Urschel was more likely to wind up as a math teacher than an NFL lineman. Now, if he chooses, Urschel can do both. Penn State outlasted the Badgers, 31-24, on Nov. 30, ending O’Brien’s second season with a strong surge that pushed him right into recruiting season.